We do try to accommodate all of our clients schedules to the best of our ability. We will contact you to confirm your requested time or make other arrangements. If you do not receive a response via phone or email within 48 hours, please call us to verify we have received your message. We do require all our pets to be up to date on all their shots. 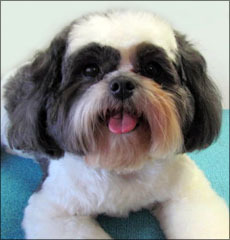 We need a shot record and vet's name & phone number for our records when pets come in for their grooming appointment. This is for everyone's safety, pets and groomers alike. Saturdays do book up quickly so you may want to call a few days in advance. Our hours may vary depending on the winter weather. Please call ahead if you have an appointment on a day that the weather has closed schools and other businesses. Our pricing varies depending on breed, size, coat, and condition of the pet. de-shedding, medicated shampoos, grinding of nails, attitudes and control of unruly pets, etc. We will give an approximate price over the phone, but a more accurate price will be given when you come in for your appointment. Messy Tessy's Pet Grooming, 10643 Business 21, Hillsboro, MO 63050 © 2011. Powered by PCTech, Inc.